John F. Kennedy International airport is quickly becoming the most pet friendly airport in the world. The new forty eight million dollar Ark terminal, set to open next summer, has been ten years in the making. The Ark is expected to make animal transitioning much more efficient. As pets and livestock have suffered extreme weather conditions on the tarmac for years, the new terminal caters to animal welfare and will include a twenty-four hour a day, fully staffed, veterinary hospital. Traveling dog owners will be able to rest easy. Twenty of the hundred and seventy eight thousand square feet, will have special amenities for your beloved pooch. 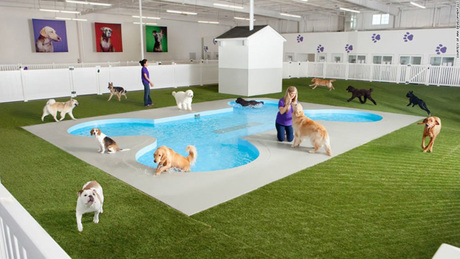 Such as two bone shaped swimming pools, doggie massages and mani-pedi’s, just to name a few. And for the pup that appreciates the finer things in life, there is a hundred dollar-a-night pet hotel, with full size beds and flat screen televisions. You will be able to rest easy knowing that you can check on your babies twenty four hours a day via webcam. T5 Rooftop is now open. Though it could be called wooftop. If you are waiting for a flight at FJK, JetBlue has opened an outdoor rooftop lounge with over four thousand square feet of family and pet friendly space. It is open to all passengers that have passed through security, doesn’t matter who you are flying with. The rooftop lounge has faux grass for canines, a dog walking route and even a play area for kids. Something for the whole family. It’s a great time to be a dog!